Stitched along Goa’s 100 km coastline, like a lace frill on the edge of a colourful skirt are some of the most alluring beaches in the world. Goa Beaches are picturesque stretches of golden sand trimming the aquamarine expanse of the Arabian Sea. The beaches of Goa are magnificent and extremely soothing. The options are so many that you might find difficulty choosing any one from them. The sun drenched, sandy beaches beckon host of travelers from all over the world through out the year. There are both crowded and quiet beaches, just pick up the one which you like most. The magnificent, pristine beaches are a stuff of dreams for the traveler. Its powdery white sand and undeveloped hinterland offer a much more rewarding experience of Goa. 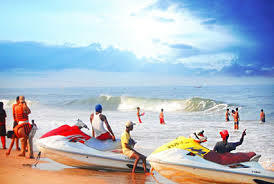 For the tourist who are keen in water sports, Goa is the right option. The water sport lovers can try their hand in surfing, swimming, angling, fishing, scuba diving, dinghly sailing, water skiing. If you are not interested in any of these, then just sit and relax or marinate yourself in the sun or simply stroll around, all will make your Goa travel absolutely satisfying. The 30 km stretch of Baga Beach is part of coastline along the west coast of Goa by the Arabian Sea. Baga is actually an extension of Calangute beach. The flat beach of Baga has white clean sands and is safe for swimming. Besides water sports and fishing, there are lively watering holes with dance floors that pep up the Goa’s nightlife. Calangute lie on the shores of the Arabian Sea of North Goa in India. It is enclosed by Arpora-Nagoa, Saligao and Candolim, in the Bardez taluka, and is just 15 km from Panaji, the capital of the state of Goa. Being a popular holiday beach resort, the small houses amidst the coconut groves behind the beach are always in demand. Anjuna Beach is a popular beach area close to Chapora fort. In Anjuna there is magnificent Albuquerque Mansion built in 1920, flanked by octagonal towers and attractive Mangalore tile-roof. This beach is a real fun for the beach lovers. 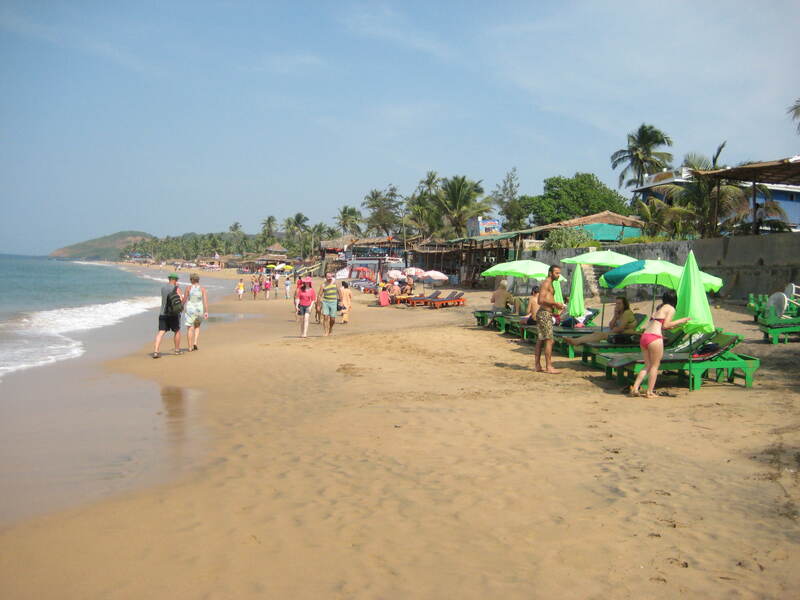 » Arambol Beach : An distinct beach in North Goa, Arambol is both rocky & sandy beach & much favoured by foreign tourists. It has a sweet water tank right on the shore. A raw beauty characterises the beaches of the southern coast of Goa. The beauty around, the sun and the sand makes Arambol one of the most few selected beaches of Goa. Colva Beach is the Queen of all beaches, as this beach is without equal in India. Colva is nothing short of paradise, with 40 Km of endless white sand fringed with swaying palms along the whole of its length and a warm, soothing sea. This is a perfect place for the tourists who are restlessly looking for a relaxing holiday. Located about 7 km from Panjim, the tranquil bay of Dona Paula, a former fishing village turned into a commercialised resort is an idyllic spot to spend your beach holidays. A perfect picturesque spot Dona Paula beach resort is a boating paradise, with speedboats and paddlers for hire. Water Scootering facilities are available here. At a distance of 37 km from Margao is the Palolem Beach. Just west of Chaudi Palolem Beach is one of the most enchanting beaches in Goa and relatively secluded, with backdrop of Western Ghats, situated in Southern most Taluka of Canacona. A half moon shaped beach offers safe swimming, for the tourists who love swimming.